Transient receptor potential (TRP) channels are familiar players in pain, and we know a lot about how temperature and irritants like capsaicin and mustard oil activate the channels and set off the sensation of pain at peripheral terminals of nociceptive sensory neurons. But less is known about how TRP channel function is shaped by the body’s own regulatory molecules, and about the roles that TRPs play on nociceptors’ central terminals. Recently, two groups made advances in both arenas, reporting novel activators for TRPV1 and TRPA1, and an unexpected pain-relieving function for spinal TRPA1. In a paper published November 22 in Nature Communications, Stuart Bevan and David Andersson, King’s College London, U.K., along with Edward Högestätt and Peter Zygmunt, Lund University, Sweden, and their colleagues report that metabolites of acetaminophen (acetyl-p-aminophenol, APAP; also called paracetamol) activate TRPA1 in the spinal cord and alleviate pain. The results offer a novel mechanism of action for one of the most common painkillers. Further, the findings shake up assumptions about TRPA1, whose activation in the periphery is generally a cause of pain, not the solution. In a second study, a team led by Diana Escalante-Alcalde, León Islas, and Tamara Rosenbaum, all at the Universidad Nacional Autónoma de México, Mexico City, show that the bioactive phospholipid lysophosphatidic acid (LPA) induces acute pain in mice by activating peripheral TRPV1. LPA is known to contribute to neuropathic pain by triggering the demyelination of sensory neurons, and the new study makes the case that the lipid also causes pain directly by opening TRPV1 in nociceptive nerve endings. LPA had previously been thought to act exclusively via G protein-coupled receptors, and the physiological significance of its newly identified interaction with TRPV1 remains to be defined. The work was published online November 20 in Nature Chemical Biology. People have been taking acetaminophen for more than a hundred years, and today it is a standby of over-the-counter pain therapy. But, amazingly, no one knows how it works. Högestätt, Zygmunt, and colleagues have shown that in the rodent nervous system, acetaminophen is metabolized by fatty acid amide hydrolase (FAAH) to AM404, a metabolite that inhibits cyclooxygenase (COX) enzymes, enhances endogenous cannabinoid signaling, and activates TRPV1 channels (Högestätt et al., 2005, and see related PRF news story). More recently, they showed that deletion or inhibition of TRPV1 in the brain largely abolishes acetaminophen’s effects in rodents (Mallet et al., 2010). Still, there was evidence for additional acetaminophen targets. Andersson and coworkers observed that acetaminophen metabolites activate primary sensory neurons in vitro. The activation did not require metabolism by FAAH, but it did seem to require electrophilic products. Knowing that reactive electrophiles activate TRPA1, the researchers wondered whether TRPA1 was another acetaminophen target. The idea of TRPA1 activators as pain killers was not so far-fetched: Activation of TRPA1’s relative, TRPV1, has been known for decades to produce analgesia, when the channel is selectively activated on the central terminals of sensory neurons in the dorsal horn of the spinal cord (Eimerl and Papir-Kricheli, 1987; Dickenson et al., 1990; Bishnoi et al., 2011). To see if acetaminophen relieves pain through TRPA1, the researchers tested the drug in mice lacking TRPA1. They chose two pain assays—a hot-plate test and intraperitoneal injection of acetic acid—where the animals’ baseline responses were not affected by TRPA1 deletion. In both tests, systemically administered acetaminophen diminished pain behaviors in wild-type, but not TRPA1-deficient mice, indicating that TRPA1 was required for the drug’s effects. The action of acetaminophen was localized to the spinal cord: In the hot-plate test, either systemic or spinal administration relieved pain in wild-type mice, but local injection into the paw was ineffective. The group evaluated whether acetaminophen or its metabolites activate TRPA1 directly in cells expressing mouse or human TRPA1, or cultured dorsal root ganglion (DRG) neurons. Using calcium imaging and electrophysiological measures, they found that acetaminophen itself did not activate the channel, but that two reactive electrophilic metabolites, N-acetyl-p-benzoquinoneimine (NAPQI) and p-benzoquinone (p-BQ), acted as TRPA1 agonists, confirming a recent report that NAPQI activates TRPA1 (Nassini et al., 2010). Supporting the idea that acetaminophen metabolites could activate TRPA1 in vivo, both NAPQI and TRPA1 showed up in the same area of the dorsal horn of the spine. The investigators localized TRPA1 immunoreactivity to the superficial layers of rat dorsal horn, overlapping with TRPV1 and other markers of primary afferent nociceptor terminals. The enzymes that generate NAPQI and other electrophilic acetaminophen metabolites—cytochrome P450, COX, and others—are known to be present in the same superficial layers, and the researchers detected a stable conjugate of NAPQI in mouse spinal cord after systemic administration of acetaminophen. Together, the results suggest that NAPQI and its relatives may be produced, and act, locally. To determine if NAPQI or p-BQ were analgesic, the investigators administered the metabolites to mice by spinal injection. Both compounds decreased pain in the hot-plate test and in paw-pressure and cold-plate tests, and the effect was abolished in TRPA1-deficient mice. In sum, the data indicate that acetaminophen metabolites relieve pain by activating TRPA1 at the central terminals of nociceptors. Backing up the case, the known TRPA1 agonist cinnamaldehyde had a similar analgesic effect when given spinally. How does activation of TRPA1 in the spine relieve pain? Channel activation on peripheral terminals of nociceptors depolarizes the cells and initiates the firing of action potentials. But at the central terminals of the same neurons, the researchers showed, depolarization had the opposite effect: It reduced the cells’ excitability. 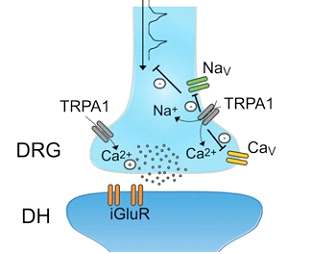 Further, TRPA1 activation inhibited voltage-gated ion channels, decreasing calcium and sodium currents. These effects would be predicted to further diminish action potential firing and inhibit the release of neurotransmitters (see schematic). Bevan and Andersson note that the mechanism they propose for TRPA1 is similar to the one put forward for analgesia brought on by activating spinal TRPV1 (Dickenson et al., 1990; Jeffry et al., 2009). Despite their analgesic properties, electrophilic acetaminophen metabolites are not promising drug leads. NAPQI damages liver cells and is responsible for the dose-limiting hepatotoxicity associated with acetaminophen. The goal of new drug development, Bevan and Andersson said, would be to deliver a compound that agonized TRPA1 but that avoided those toxic side effects. Previous efforts to replace acetaminophen have come up with alternatives that do not produce toxic metabolites, but the compounds also fail to produce analgesia, Andersson noted. On the plus side, TRPA1 activation and analgesia do not appear to require a reactive, toxic compound. In the current study, the researchers found that a non-toxic compound, the cannabinoid Δ9-tetrahydrocannabiorcol, selectively activated TRPA1 without affecting cannabinoid receptors. When administered to mice, the compound had antinociceptive effects similar to those of the electrophilic acetaminophen metabolites. TRPs must feel the influence of lipids, since the channels spend their lives swimming in the stuff. Yet relatively little is known about how lipids might control TRP channel activity. One busy bioactive phospholipid is LPA, which signals through a family of LPA-specific G protein­­-coupled receptors to control a wide variety of cellular functions, including proliferation of neural progenitor cells (Noguchi et al., 2009). LPA also helps initiate neuropathic pain after nerve injury by setting off demyelination and activation of sensory A fibers (for a review, see Ueda, 2011). The connection between LPA and pain caught the attention of Diana Escalante-Alcalde at the Universidad Nacional Autónoma de México. She had developed mice that lacked the LPA-degrading enzyme LPP3 in neural cells and were expected to have increased LPA levels. Escalante-Alcalde teamed up with colleague Tamara Rosenbaum to investigate the animals’ pain sensitivity, and found that the LPP3-deficient mice showed increased responses to capsaicin and painful heat. In addition, LPA itself caused acute pain when injected into normal mice. TRPV1 appeared to be involved, because the pain sensitivity due to LPP3 deletion or pain from LPA injection was greatly reduced in mice that lacked TRPV1. Further evidence that TRPV1 might contribute to LPA-induced acute pain came from in-vitro channel recording experiments. First author Andrés Nieto-Posadas and coworkers found that, in membrane patches from DRG neurons, LPA-induced currents were blocked by the TRPV1 inhibitor capsazepine, and were absent in neurons from TRPV1-deficient mice. The group assumed that the effects of LPA on TRPV1 were mediated by LPA receptors, until several inhibitors of LPA receptor signaling failed to prevent TRPV1 activation. A recent study reported that LPA contributes to bone cancer pain by increasing TRPV1 activity via an LPA receptor and downstream protein kinase C (PKC) signaling (Pan et al., 2010), so the researchers checked to see if PKC was involved. Again, the answer was negative: PKC inhibitors had no effect on LPA-induced TRPV1 currents. After about six months of searching, Escalante-Alcalde and Rosenbaum said, they finally realized that LPA might not be working through any of its receptors. Instead, the lipid seemed to be activating TRPV1 directly. In support of that idea, an LPA receptor inhibitor, BrP-LPA—which is structurally similar to LPA—activated TRPV1, and, when injected into the paws of mice, elicited pain. In addition, the researchers showed that LPA-coated beads could bind TRPV1 in membrane protein extracts from cells. To explore how LPA might interact with TRPV1, the researchers compared it to another lipid ligand of the channel, the membrane phospholipid phosphatidylinositol-4,5-bisphosphate (PIP2). While it does not activate TRPV1, PIP2 modulates the channel’s responsiveness to capsaicin (Ufret-Vincenty et al., 2011). In-vitro binding and mutagenesis studies suggested that LPA and PIP2 bind to the same site in the C-terminal cytoplasmic domain of TRPV1, and that PIP2 also occupies a second binding site from which it allosterically inhibits LPA binding. Still to be determined is whether direct activation of TRPV1 by LPA has a role in chronic pain. Hiroshi Ueda of Nagasaki University, Japan, told PRF in a e-mail that, based on his group’s results, LPA’s biggest contribution to neuropathic pain comes from its effects on myelinated A fibers, not on TRPV1-expressing nociceptors. He added that LPA does not seem to be involved in inflammatory pain. However, Rosenbaum, Islas, and Escalante-Alcalde said they suspect that direct activation of TRPV1 by LPA could be important in acute pain. They note that LPA is associated with acute pain: Venoms from several snakes and spiders contain enzymes that produce LPA (Sams et al., 2001; Caccin et al., 2006), and atherosclerotic plaques that cause ischemic pain contain high levels of LPA (Karliner, 2002). “In the last decade, we have been starting to understand how lipids can directly interact with ion channels,” Rosenbaum said. “It turns out lipids are very important for ion channel function.” For TRP channels, Rosenbaum said, little is known about interactions with lipids. 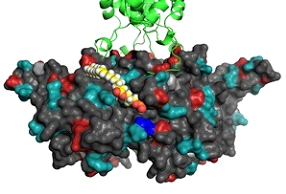 She and her collaborators are using fluorescence resonance energy transfer (FRET) techniques to look for conformational changes in TRPV1 upon LPA binding. The researchers are also planning a screen of lipids—endogenous and synthetic—to identify others that influence TRPV1 activity. Lysophosphatidic acid directly activates TRPV1 through a C-terminal binding site. Nat Chem Biol. 2012 Jan; 8(1):78-85. Epub 2011 Nov 20. TRPA1 mediates spinal antinociception induced by acetaminophen and the cannabinoid Δ(9)-tetrahydrocannabiorcol. LPA appears to be essential in the estrous cycle, early pregnancy and the intestinal cell restitution so it is found in these tissues normally. This article indicates LPA's role in activating TRPV1 receptors, which the visceral DRGs in the uterus and colon express. Could there be a connection between LPA dysfunction and chronic pelvic pain syndromes?